Home > Blogs > What if Analysis in Excel? What if analysis in Excel allows you to try out different values (scenarios) for formulas. The following example helps you master what-if analysis quickly and easily. 1. 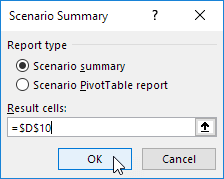 On the Data tab, click What-If Analysis and select Scenario Manager from the list. 2. 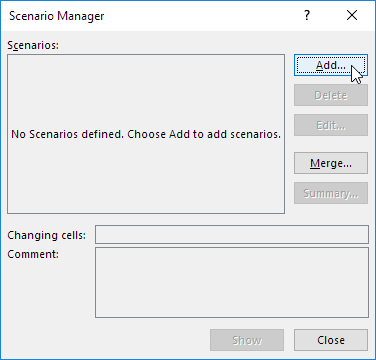 Add a scenario by clicking on Add. 3. Type a name (60% highest), select cell C4 (% sold for the highest price) for the Changing cells and click on OK.
4. Enter the corresponding value 0.6 and click on OK again. 5. Next, add 4 other scenarios (70%, 80%, 90% and 100%). Conclusion: if you sell 70% for the highest price, you obtain a total profit of $4100, if you sell 80% for the highest price, you obtain a total profit of $4400, etc. 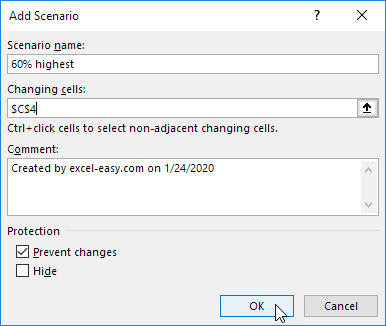 That’s how easy what-if analysis in Excel can be. What if you want to know how many books you need to sell for the highest price, to obtain a total profit of exactly $4700? 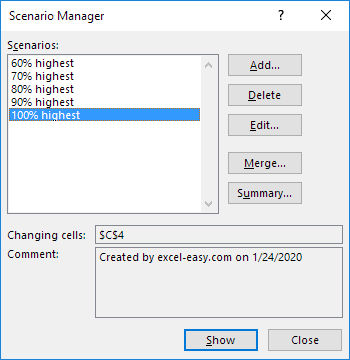 You can use Excel’s Goal Seek feature to find the answer. 1. On the Data tab, click What-If Analysis, Goal Seek. 3. Click in the ‘To value’ box and type 4700. 4. Click in the ‘By changing cell’ box and select cell C4.